New Field - Triggers when a new field is added to a form. 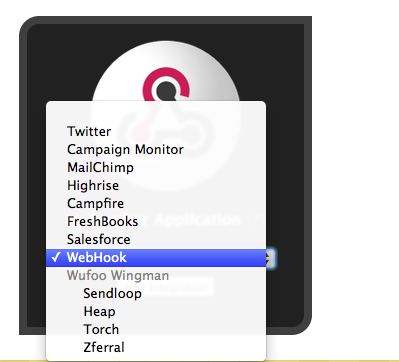 New Entry (webhook) - Triggers when someone fills out your form instantly using webhooks (but you will need to create the webhooks manually). New Entry - Triggers when someone fills out your form. New Form - Triggers when you build a new form. New Entry (poll) - Triggers when someone fills out your form. This is a slow version wherein we check periodically for new entries. Create Entry (Legacy) - Creates a new entry in Wufoo for a form and data you select (except not files). Create Entry - Creates a new entry in Wufoo for a form and data you select. You can then give your Account a title or label, which is just for your convenience and helps you track multiple accounts. It doesn't have any affect on which Account you actually add to Zapier. You will also need to enter your Wufoo username and password. Finally, if you have multiple Wufoo subdomains tied to your account you'll need to specify which one you want to use. Once your Account has been added and tested you'll see this if everything is good! You may notice the webhook url listed under the selected Account. 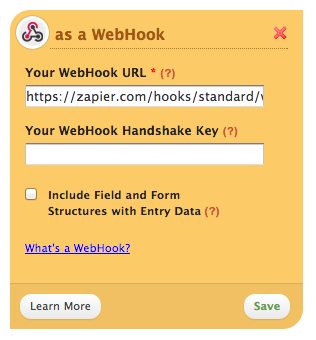 This is valid if you want to use the "New Entry (webhook)" trigger and allows Zapier to receive form submissions instantly rather than having to poll Wufoo using whatever polling interval your account plan has. 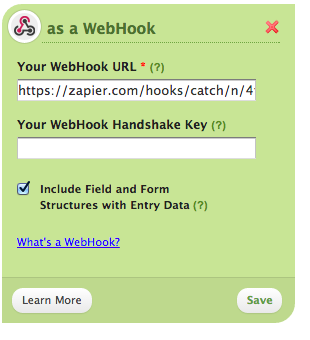 Then on the notifications page locate the box with the text "to Another Application"
Finally, copy and past the url provided under your selected Account on the zap creation page to the Webhook Url on Wufoo. This error from Wufoo happens when you have too many zaps for a particular form. Fear not though, switching to the "New Entry (poll)" trigger will eliminate that concern. Alternatively, you could add multiple actions to a single zap instead of creating multiple zaps using the same form as your trigger. If you are using the trigger "New Entry (poll)" for multiple Zaps, it's entirely possible to hit your Wufoo API limits. There are two potential solutions. This avoids using the Wufoo API altogether. However, if you are having problems with 403 Errors this is likely not a good solution for you. Instead check out option 2 below. Each user in Wufoo has their own API keys. Creating a new user lets you use their API key for some of your Zaps to reduce the load on the other API key. To make this work, create a new user in Wufoo by navigating to the users tab inside of your logged in Wufoo account. Once you have a new user created in Wufoo. Navigate to your connected accounts inside of your logged in Zapier account. Select "connect a new account" in the top right and pick Wufoo. When prompted, fill in the credentials for the user you just created in Wufoo. DO NOT use the credentials for your old account. This must use the new credentials. Now when you create Wufoo Zaps using the "New Entry (poll)" trigger make sure that half use your original connected Wufoo account and half use the newly connected Wufoo account. If so, simply delete anything with a Zapier.com WebHook URL (don't worry, as soon as you turn your zaps On we'll recreate anything we need to!). Now, go and turn On every zap for that form. Everything should be good to go now! Currently multi-select and checkbox fields are not supported by Zapier. Pause your zap by switching the toggle to "Off"
When you duplicate a form in Wufoo, that also duplicates any webhook notifications. Since that's what your Zap uses, you'll end up with two different forms pointing to the same Zap. 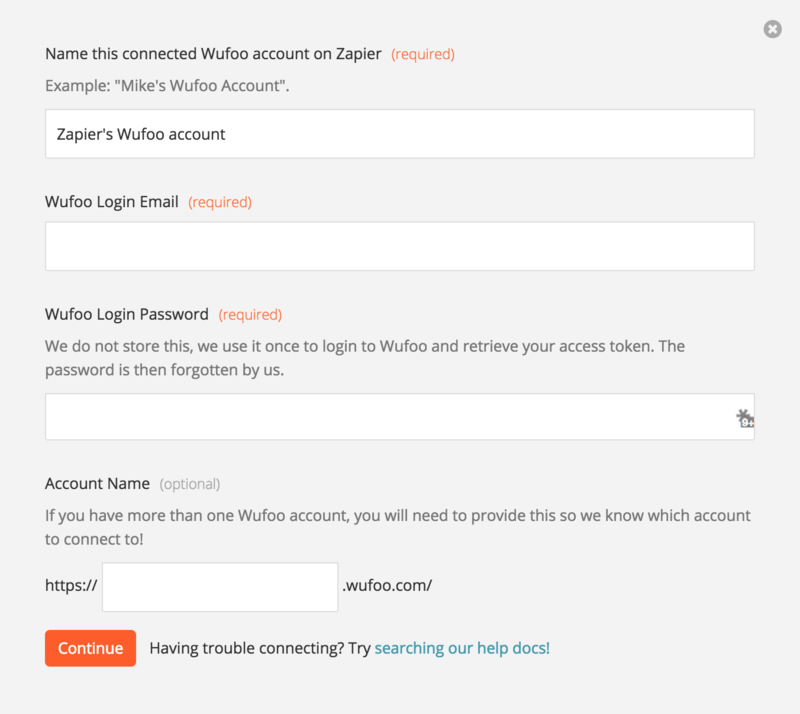 Go to the notification settings for the Wufoo form which should not be sending to Zapier. And remove the Zapier webhook from there. If you're not sure, contact our support team and we can double-check for you! If you are using a webhook for Wufoo, they can't use your timezone settings from your account. Times will be based instead on their server time which is PST. If you need to adjust any date/time fields, you can use our Modifier options to adjust your results or add a Formatter step to your zap to adjust the date/time. Data in fields that are marked as “Admin Only” are not returned via the API. However, data from “hidden” and encrypted fields will be shown, so you can change the fields to be hidden if you need this information.